Oct 24, 2017: Do any 3DS cases fit well? Nov 13, 2017: Tell me about your Switch gear/accessories. Need recommendations please! Nov 18, 2017: What's your favorite Switch case? Nov 23, 2017: What are the accessories that don't come with a switch and are absolutely essential? Nov 24, 2017: UK / EU - Switch Deals for Black Friday! Dec 07, 2017: Question: Will the Switch fit in the Premium Travel Case with a Mumba shell? 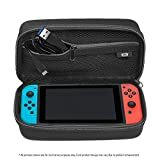 Dec 11, 2017: Looking for recommendations on Switch cases. Feb 17, 2018: Best carrying case option for Meo Grip case? Feb 18, 2018: Any portable players here that have used Joy-Con grips such as these for at least 2-6 months, what's your favorite? Mar 09, 2018: Digital-only Switchers! What do you do with the empty cartridge slots on your carrying cases? Apr 23, 2018: What's the Nintendo Switch accessory you use the most? May 03, 2018: Skull and co grip case back on Amazon! Aug 16, 2018: Are there any large travel cases (holds dock etc) that can hold a Switch in a smaller case? Nov 30, 2018: Do I REALLY need a screen protector? Jan 02, 2019: What's the purpose of this indent on the bottom of the inside of my Switch case? Feb 12, 2019: Just watched a guy lose all his Switch games on NYC subway. Can you help me find him Reddit?